The porch swing at my mother’s is a favorite place of reflecting. Yo-Yo, the spoiled cat, likes to attend his daily regimen of grooming while bathed in the light filtering through the screen. There has been many pouring of heart and soul on this porch for more years than I can count. I have been prayed over and read to, prayed for in the quiet dawn, and as the hush of dusk fell on the grounds. I have felt the power behind the prayers prayed from this porch. God heard. AND He answered. Today, I need to sit on that porch of prayer and peace. Today, I need to feel the strength that comes from the prayer—the power and anointing is ours when He reaches down, through and into our lives and meets the need. The need? I can’t put a name to it. Have you ever been in that place? Where the prayers you pray seem to stop at the ceiling? The urgent need of your life remains nameless to you, all the while He knows the need of your heart. I’ve been there more than once. I sit in that place today. Even though I can’t get to that porch today, I can get to the cross. Unload and unwind. Allow the fingers of the Holy Spirit to kneed away the frustrations of life and apply the balm that soothes and strengthens. Strength is gathered. Soldier boots are pulled on and laces tightened. With the renewed strength for the journey, we carry on in a run now—headed for the finish line. Doing all we can for the cause of Jesus Christ! Keep praying and believing sisters! This entry was posted on Wednesday, May 27th, 2009 at 1:53 pm	and posted in For Sisters of Faith. You can follow any responses to this entry through the RSS 2.0 feed. « Coming This June…to a computer near you! Angie, Yes I have been there many times, and I am there now, He tells me to sit quietly for now, and when I move do it slowly, but only when He says to. My boots are ready!! For someone who is in the 'pits', you sure write a mean post!!! His light is a-shinin' through you sweet sista….never doubt that, just keep on keepin on!!! Yes, I have been there dear one. You shine so brightly, regardless where you are. I love you. Certainly have been there…more than I want to admit. 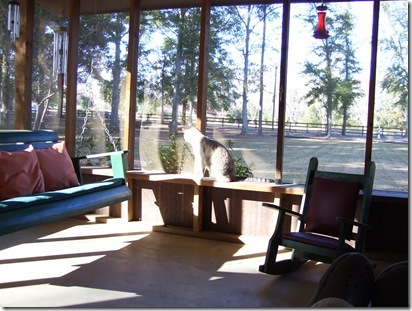 What a beautiful porch….surely God's peace will be found there! Sweet Sister, while I'm not there to sit on that precious and special porch my prayers are going up to heaven reaching the ears of our Almighty GOD for you even this moment.